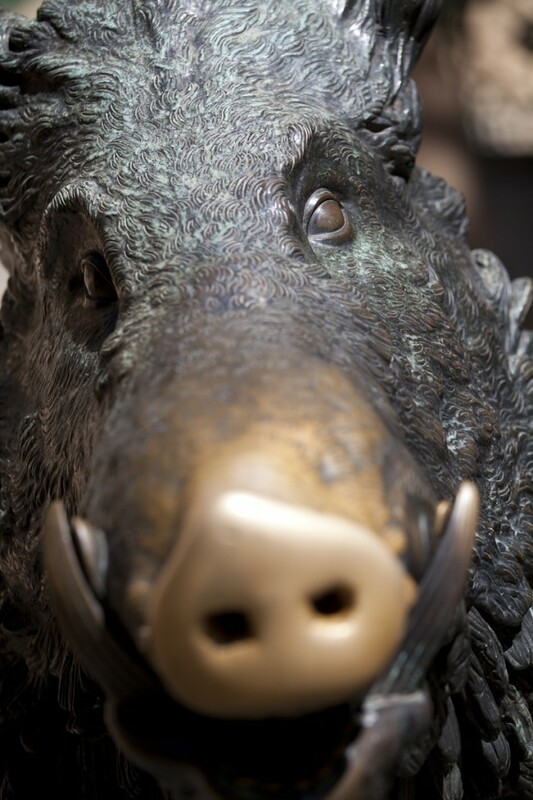 Il Porcellino, meaning ‘the little pig’, is a larger than life-sized bronze wild boar, anatomically realistic and resting on its left haunch and front legs. 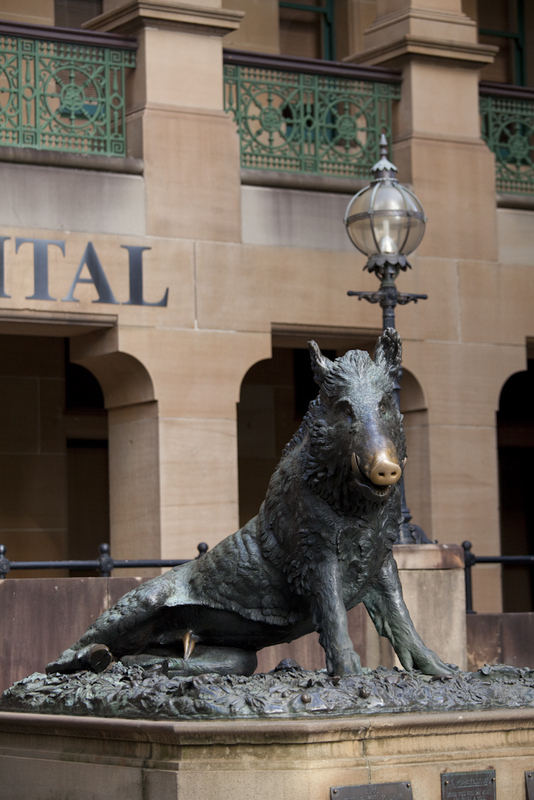 It is located outside the Sydney’s oldest hospital, Sydney Hospital, facing Macquarie Street. The sculpture is an exact replica of an original by Pietro Tacca which has stood in Florence, Italy, since circa 1633, and is given the local Florentine nickname il porcellino. 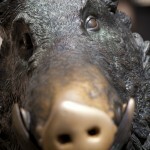 The boar stands over a pool containing representations of tortoises, snakes, frogs, snails, lizards and crabs. In front is a cast iron fountain receptacle. 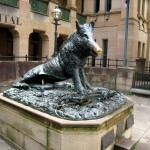 The boar and the fountain sit on a sandstone base, approximately 1.8 metres squared, and the whole is approximately 1.6 metres high. 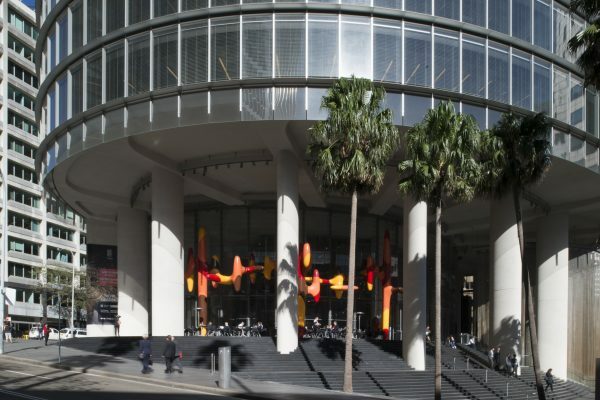 The sculpture was a gift to the City of Sydney from Marchesa Fiaschi Torrigiani, who donated the artwork to the City in 1968. It is a memorial to Thomas Fiaschi and Piero Fiaschi, her father and brother respectively. Both worked as honorary surgeons at the Sydney Hospital and both had distinguished military careers. Thomas Fiaschi served in the Boer War and World War I, reaching the rank of General in the latter. Piero became a Colonel during the same war. Thomas also founded the Dante Alighieri Art and Literary Society in Australia and was president of the NSW Wines Association. Pietro Tacca (1577-1640), the Italian sculptor of the original Florentine bronze, was the chief pupil of Giambologna. He took over the workshop of his master on the elder sculptor’s death in 1608, finishing a number of Giambologna’s incomplete projects, and succeeding him almost immediately as court sculptor to the Medici Grand Dukes of Tuscany. Tacca began in a Mannerist style and worked in the Baroque style during his maturity. 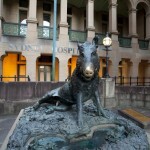 Il Porcellino was a gift to the City of Sydney from the Marchesa Clarissa Torrigiani to help raise funds for Sydney Hospital. The original bronze was commissioned by Cosimo II de Medici in 1621 and is now in the Museo Bardini, in Florence, with a replica on display the Mercato Nuovo. The original bronze was modelled on a Hellenistic Greek marble original. Numerous copies of the Florentine bronze exist around the world. In 1962, a replica was given by another donor to a children’s hospital in Kansas City, where was believed to have generated a large amount of funds for that institution. The Marchesa hoped that such a donation might similarly assist the Sydney Hospital. 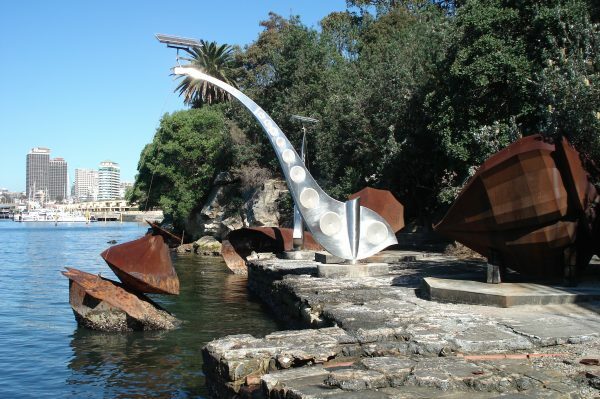 The Sydney bronze was completed and installed by 18 April 1968. The formal presentation ceremony was later conducted on 16 December 1969, as the Marchesa had had to return suddenly to Italy due to illness in the family. 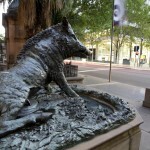 At the base of the monument on the left, an inscription reads: 1968 / This wild boar fountain of good luck / is a donation from Clarissa Torrigiani in / memory of / her father Dr Thomas and her brother / Dr Piero Fiaschi. 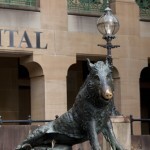 / ‘Porcellino’ collects money for the Sydney / Hospital for which both worked as Hon Surgeons. 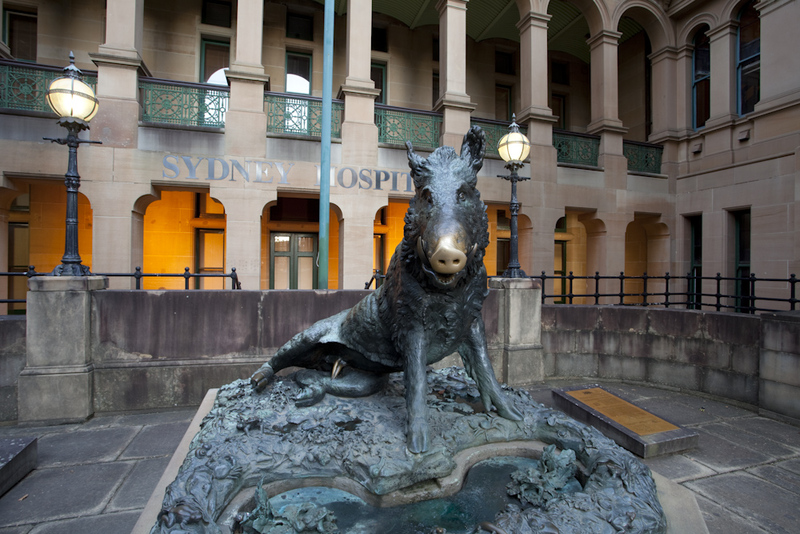 At the base in the middle, it reads: IL PORCELLINO / When you rub my nose / and make a wish / your donation / supports / research, education / and / development / at Sydney Hospital / Australia’s First Hospital. 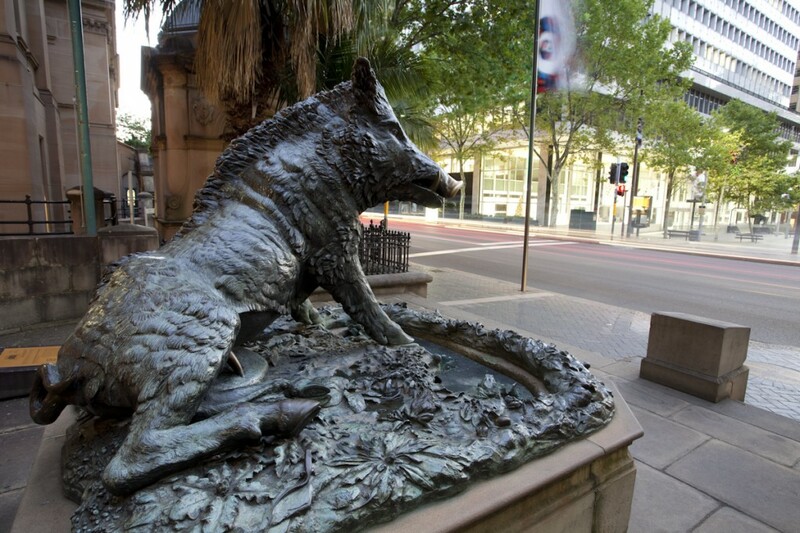 At the base on the right, it reads: This wild boar / has come from Florence to Sydney / as a link of friendship between / Italy and Australia / in memory of / Brigadier General Thomas Fiaschi / who loved and served so gallantly / for both countries. 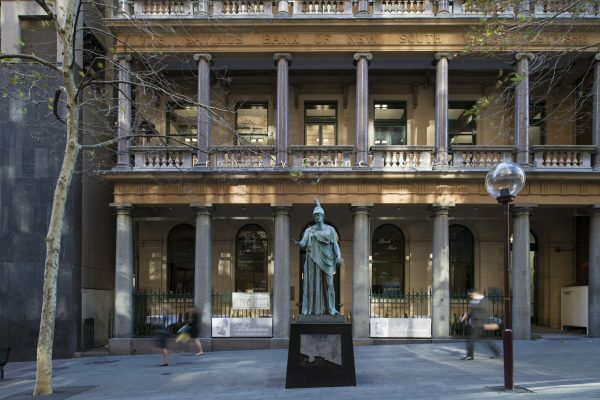 At the base, skyward facing it reads: The sculpture of ‘Il Porcellino’ was presented to the City of / Sydney by The Marchesa Fiaschi Torrigiani of / Florence, Italy, and accepted by the Chief Commissioner, / The Hon Vernon Haddon Treatt. / MM., QC., MA., BCL, / on 16-12-68. / L.H. Luscombe / Town clerk. 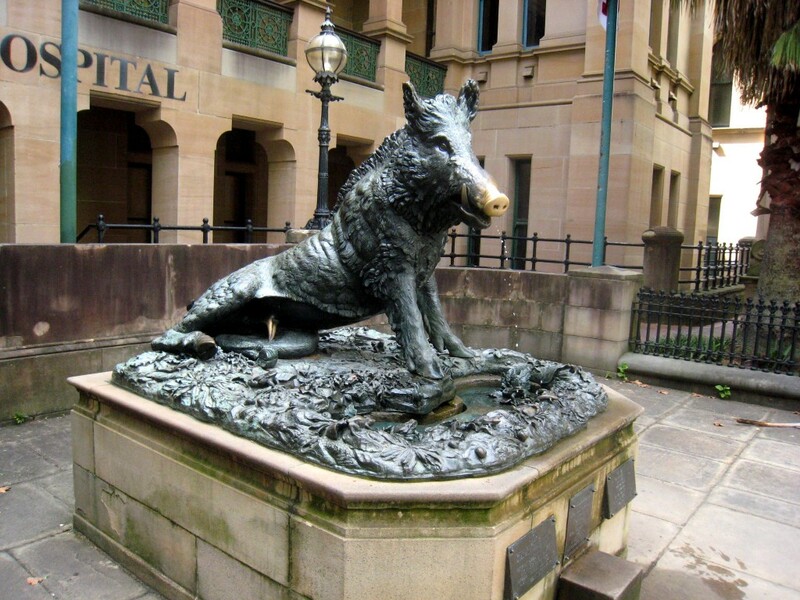 At the base facing Macquarie Street, it reads: Il Porcellino / If coins are dropped into the fountain / or donations put into the box / legend says / that if you rub the nose of the boar, / you will be endowed with good fortune. / All donations will care for the sick / in Sydney Hospital. Hospital for which both worked as Hon Surgeons. who loved and served so gallantly both countries.